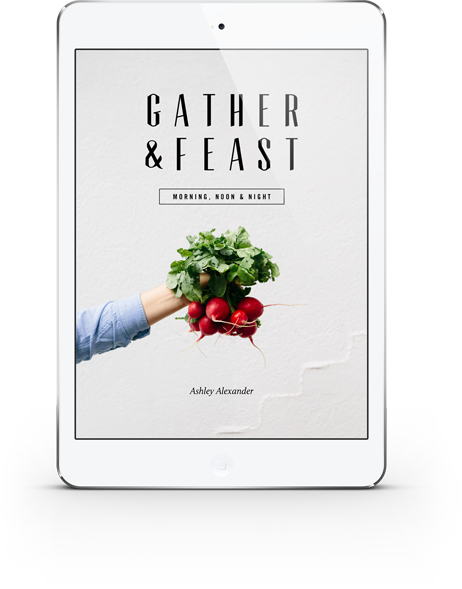 I'm Ashley and welcome to Gather & Feast. I live in beautiful Melbourne, Australia with my wonderful husband Mike. We love exploring our city in all its diversity; finding beautiful shops with local wares, exploring the mountains (I have a crazy fondness of beautiful trees and moss), visiting lovely cafes and restaurants, and my favourite, wandering through farmers' markets. I don’t know about you, but I get excited by fresh produce and its endless possibilities; the texture, the colour, the variety. The way fresh food should be with all its beautiful imperfections. I love being able to see and talk to the wonderful people who grow the produce I am purchasing, from their hands to mine. There is such beauty and community in food; growing, preparing, cooking it with the best part being eating and sharing it together. As a self taught cook, I spent a lot of my early years learning in the kitchen. Mum enjoyed teaching my brother, sister and I to cook from a young age, preparing three course meals for dinner parties by the time we were 12 (well played Mum, well played). I am very thankful for all the valuable time spent and the lessons we learnt. Mum always taught us to cook using natural and healthy ingredients and instilled in us the value of whole and organic foods. (Tofu ice-cream for the win!) Thanks Mum! So with my love of food, and after the continual encouragement and urging from my friends and husband, I decided it was time to start a food blog, and with much excitement Gather & Feast was born. YEA! 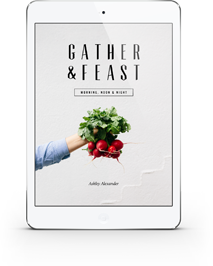 Gather & Feast was inspired by a thought of the multifaceted meaning of to gather and feast. The gathering together of beautiful food, and also the gathering together of friends and loved ones. To feast, to celebrate, to share, to enjoy, to love. To bring things or people together into a group. To choose and collect (things). To get or take (things) from different people or places and bring them together. A special meal with large amounts of food and drink. An elaborate and usually abundant meal often accompanied by a ceremony or entertainment. Something that gives unusual or abundant enjoyment, a visual feast. A periodic observance commemorating an event or honoring a person, or thing. My aim through this site is to share with you wholesome and nutritious recipes, using natural ingredients and fresh in-season produce. My hope is to encourage you, the passionate food people, to gather and feast with the ones you love in a beautiful, fun and stress-free way and enable you to enjoy food that is visually pleasing as well as delicious and nutritious. I look forward to the exciting times ahead. Let's create beautiful food, feast with friends, gather with loved ones and embark on many new adventures. The perfect serving boards and dishes. Rustic wooden boards and beautifully handcrafted dishes are an easy way to add colour and texture to a table. I have an obsession with homewares. My collection of bowls, plates and vintage cutlery is ever growing! Preparation is key. I like to prepare as much as I can in advance so I can spend quality time with my guests. 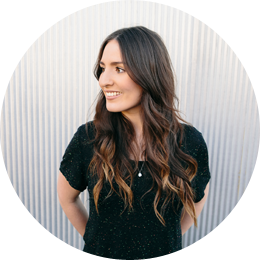 What (if anything) scares you about entertaining? Definitely the weather. I just love entertaining outdoors, and the weather is the one thing you just can't control. One of my signature dishes is ironically one of the easiest to prepare! It is simply a large platter of fresh and dried fruit, nuts, dark chocolate and any other fun food items I can find in the pantry, all piled high on a beautiful rustic board. Anything frozen! I love gelato, ice-cream, frozen fruit, and even frozen peas! Growing up my mum would often give my brother, sister and I frozen peas to snack on. We thought they were little green ice cream dots. Ha! Even now, I still love eating them. My husband Mike is great at putting together the perfect playlist. He has a different playlist for every occasion... Christmas, road trips, dinner with friends, and even baby showers! Some of our highlights include James Vincent McMorrow, Ray LaMontagne, Yuna and any vintage jazz. Sparkling water, fresh berries, almond milk, greens, parmesan cheese and eggs. NOPI. Yotam Ottolenghi’s amazing restaurant in London. It was one of the most delicious, fresh and flavour packed meals I have ever experienced. Their apple and gingerbread with celery sorbet dessert was incredible! 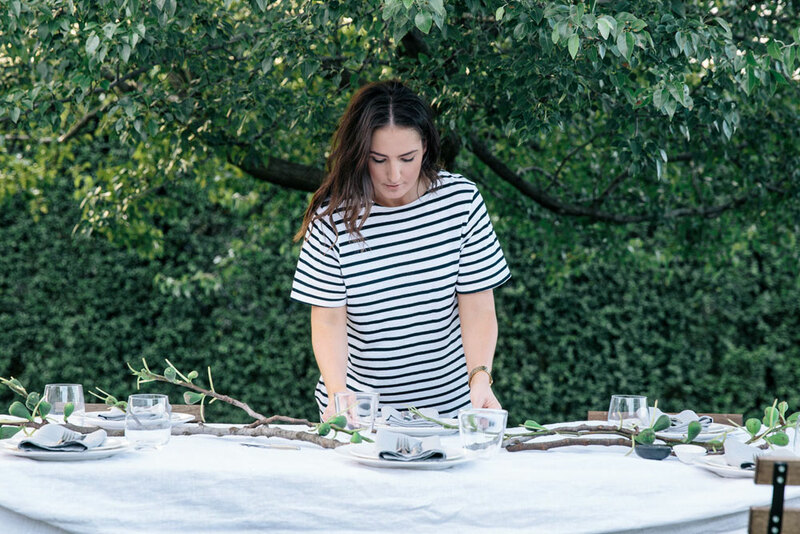 I love neutral linens, raw wood and a touch of green... using either foraged greens from my garden or visiting my favourite florist who has the most unusual and lush selection of foliage and flowers. Usually a comfortable fun dress and ankle boots (although if I'm indoors I'll most likely be barefoot). Natural, fresh, relaxed, fun, deliberate. I love fresh. I love local. I love simple. I love natural. I love white. I love grey. I love trees. I love moss. I love icecream. I really love icecream. I love clouds. I love the sky, always, all the time, its a problem. I love mint tea. I love love. I love people. I love laughing. I love homewares. I love spoons. I love linen. I love markets. I love coconut, everything coconut. I love greens. I love apples. I love breakfast. I love beautiful cookbooks. I love fresh air. I love travel. I love roadtrips. I love exploring. I love kindness. I love learning new things. I love peoples stories. This week’s recipe is my delicious homemade granola.